Please click on the section headings below to chose the section you wish to read. Meteoroid: a small (dust to boulder sized, typically less than 10m across) rock in space. Meteor: A bright fireball or "shooting star" caused when a meteoroid enters the Earth's atmosphere and is heated. Most of these meteoroids are very small and never reach the Earth's surface. Meteorite: A meteoroid, which becomes a meteor and survives passage through the Earth's atmosphere to hit the surface. Falls: Meteorites recovered after they have been seen to fall, usually the fireball has been observed. 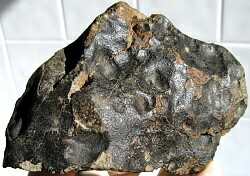 Finds: Meteorites which have been found, but were not see to fall. At the time of writing there are approximately 1080 recognised meteorite falls, this is only 3% of all recognised meteorites (over 36000 falls and finds in total). Most meteorites are thought to have originated in the asteroid belt, collisions between two asteroids can cause pieces of them to be ejected into the inner solar system where they may eventually fall to the Earth's surface. The asteroid which a meteorite originated on is called its parent body.